In October 2005, I ran into several Guatemalan guest workers in a village laundromat. My first guess was that they worked on a large dairy farm, but in my poor Spanish and their almost non-existent English, we managed to communicate, and they made me understand that their jobs were in new home construction! I was surprised and decided to find out more about immigrant workers in my rural area. In this article I share some of what I discovered. As I became acquainted with the Guatemalans I had met, I found that, despite their friendliness, they were terribly isolated from the community they lived in. The language barrier, the area’s homogeneity (whiteness), long work days six days a week, and lack of transportation were to blame. They stay in touch with their wives and families back home with international phone cards, and I imagine they send as much money back as they can. I was able to get them connected with a Literacy Volunteer who taught weekly English classes just for them. When he started, there were 15 men living in two apartments — eight of them were crammed into two bedrooms. In my digging, I found one case where community members had come together to befriend a group of immigrant workers in their town. Through the Granville Ecumenical Council (60 miles north of Albany), church youth groups play soccer games with immigrant workers and four bilingual volunteers offer English instruction. When a 17-year-old worker was struck with appendicitis, the council made sure his medical bills were taken care of and persuaded the employer to contribute. The Guatemalans I had met were here legally, which is definitely the exception to the rule. They had come on the federal visa program called H2B, the designation for unskilled non-agricultural workers. This tiny program only allows 66,000 new workers into the entire U.S. on temporary work visas each year. In talking with worker advocacy attorneys and paralegals, I learned that H2B (non-farm) workers have very meager rights. In fact, amazingly, the H2A program for farm workers offers much better protections. An H2A employer is required to pay for the workers’ visas, transportation from their countries of origin, and housing; and the wages are set at the adverse effect wage rate, which for New York State in 2005 was $9.05 per hour. The H2A program, however, pertains to fruit and vegetable farms only, not to dairy or other livestock farms. This complicated, bureaucratic program is about 50 years old. The only advantage I could find for the H2B program from the worker perspective is that its visa holders (the employees) are covered under the U.S. Fair Labor Standards Act and therefore must be paid time and a half for all overtime worked. But they typically must pay for their own travel, visa, and any fees required by a home country agency or contractor to land the job; they also pay for housing. I learned that workers cannot change employers under either of these guest worker programs. This situation makes them very fearful and reluctant to assert their rights. It appears quite common that they are unfamiliar with the minimal rights they have, including their right to a safe work environment. The workers I met often work on scaffolding. They told us that their employer warned them if they got hurt on the job, they would have to go home. The foreign work force has grown in leaps and bounds. Immigrants pour into the country in a quest to better their standard of living and escape challenging and repressive social conditions in their homeland. Employers desire low-wage workers who are eager and docile. Foreign workers are invisible but nonetheless prevalent in my area. Mexicans and Guatemalans have become very important to dairy farmers. They milk cows and also work as calf and feed managers on some farms. About 10 years ago, they worked only on the largest, factory-scale farms (i.e. 500 cows and up), but now even family-size,100-cow dairies may employ foreign workers. Downstate, immigrant workers are seen seeking employment on street corners and at sleazy day worker agencies, enduring much abuse and exploitation. Throughout the Hudson Valley, it is generally known that many orchards, vegetable farms, and nurseries have Jamaican or Latin American field and harvest crews. In our region, some stone quarries are also becoming dependent on Latino crews, and I have been told that trash haulers in one suburbanized portion of the region employ foreign workers as well. For six months a year (May through October), the racetrack at Saratoga has 350-400 Mexican and other Latin American workers working as grooms and “hotwalkers” for horse trainers. They live in unheated cinder block rooms. All furnishings and cooking equipment must be brought in on the horse trailers that transport workers’ belongings. It is my understanding that everyone in horse racing must be licensed, and therefore all foreign workers must also be documented. While accurate numbers seem impossible to find, this initial research confirms the national trends. More and more sectors which cannot set up shop abroad now routinely seek out cheap, energetic foreign workers — documented or not. The employers and service providers I spoke with seemed quite aware that most people they deal with are undocumented. 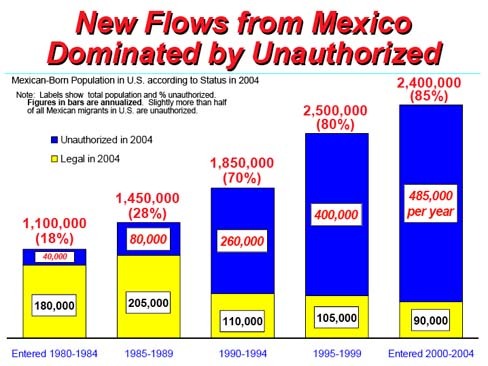 In recent years, 80-85% of the migration from Mexico has been undocumented, according to the Pew Hispanic Center. Immigrants are unhappy with their shaky position in the US. They are disenfranchised in many ways, making them vulnerable to their bosses, coyotes, predatory lenders, and landlords. The border often separates families. I was told of one Central American who had not seen his wife and children for six years. It is dangerous to come back to the US after an undocumented worker visits home. These foreign workers have no safety net — whether unemployment, food stamps, disability, health insurance, or Social Security (though it is deducted from their pay). Without proper papers, they may find it impossible to even open a bank account. In many states, they cannot obtain a drivers license. They may be barred from sending their children to school or college (but are not exempted from Selective Service registration). And even legal citizens and “documented” individuals have been deported or otherwise singled out by racist law enforcement policies. Employers, immigrants, and worker advocates are in agreement that US immigration law is not functional. Unfortunately anti-terrorist hysteria and xenophobia are gaining the upper hand in reform efforts. The draconian legislation passed by the US House of Representatives in late December would only make things worse if it becomes law. This sweeping legislation makes it a felony to be an undocumented worker in the US, criminalizing immigration status for the first time in our history. It also makes it a felony to assist an undocumented person in staying in this country. It requires all employers to verify the legal status of their workers with enforceable penalties. It also directs the Department of Homeland Security to build 700 miles of fence along the US-Mexico border and sets up a system for deputizing local law enforcement personnel to act as immigration enforcement. A partial alternative to this bad bill was the historic compromise proposal hammered out by agricultural employers and farmworker groups. However, Congress did not pass this bill introduced most recently as the Agricultural Job Opportunities, Benefits, and Security Act of 2005 (AgJOBS). It would have allowed, on a one-time basis only, some 500,000 immigrant farm workers with significant work history on US farms to stay legally and gain a path toward citizenship. The 50-year-old H2A agricultural guest worker program would be streamlined into a new form that would ensure employers access to the workers they need without a lot of bureaucracy, while giving workers the essential right to change employers, thus reducing abuse. An estimated 70% of fruit and vegetable harvest workers are undocumented. There is much to be done to improve the lot of immigrant workers in our region and nationally. Though they may still be relatively invisible in the greater Capital District, their plight affects the rights and status of all working people. As the Immigrant Worker Rights Committee, we support the right of foreign workers to be here and to receive fair treatment both on and off the job. Our long-term goal is assisting these workers in organizing, finding their voices, and gaining their rights. Tracy Frisch is a freelance journalist and social activist. This article will be also published in Solidarity Notes, a labor newsletter in the Capital District, New York.